Packers for years have been grappling with the problem of narrow mouth opening of preformed Flat Bottom Pouches or three-dimensional (3D) pouches on the filling lines. The vacuum cups of conventional Pick – Fill & Seal (PFS) Machines clamp open a pouch by holding its two-side gussets thus resulting in a very narrow opening. This leads to rather sluggish filling of these pouches without being able to have full mouth opening. Let’s face it; the impeded filling speed of conventional PFS machines has not been able to do justice to the state-of-the-art 3D / flat bottom pouches that are touted to take flexible packaging to a whole new level of functional and aesthetic excellence. India’s largest fully integrated multinational flexible packaging materials and solution company Uflex Limited with this problem statement at hand, has engineered the Multi-Lane Automatic Linear Pick – Fill & Seal Machine. The vacuum cups of this machine unlike the conventional PFS machines clamp open a pouch by holding its 4 Ps or the panels thereby opening up the mouth as wide as it gets. If we compare any rotary PFS machine to the newly engineered Multi-Lane Automatic Linear Pick – Fill & Seal Machine, the comparable speed of filling and sealing 3D/flat bottom pouches has more than doubled. Uflex is the only company in India to have indigenously engineered this simple and intellectually appealing machine. This machine can be equipped with Volumetric, Gravimetric or Liquid Filling systems. Commenting about the features of the new Four Lane Automatic Linear Pick – Fill & Seal Machine; UFLEX LPFS-4T Mr Ajay Tandon, president and CEO, engineering business, Uflex Limited said: “This sophisticated machine is a classic example of Interventional Engineering by Uflex. Our customers i.e. packers approached us with the pain point of not being able to rapidly fill the 3D / flat bottom pouches. “Narrow mouth opening of pouches in the conventional PFS machines was actually bringing down the productivity of the packers. Some of them even filled up the pouches manually. It took us 15 months to engineer this machine at our plant in Noida. Expressing delight at the launch of the Four Lane Automatic Linear Pick – Fill & Seal Machine; UFLEX LPFS-4T, Mr Ashok Chaturvedi, chairman and managing director, Uflex Limited said: “The flexible packaging industry has evolved rather rapidly and now one can see the most innovative packaging solutions on the retail shelf. Flat Bottom Pouches or the 3D Pouches are one of the most brilliant and efficient examples of modern day packaging. Owing to the unavailability of a suitable filling machine, the magic of these brilliant 3D pouches was somewhat restrained. 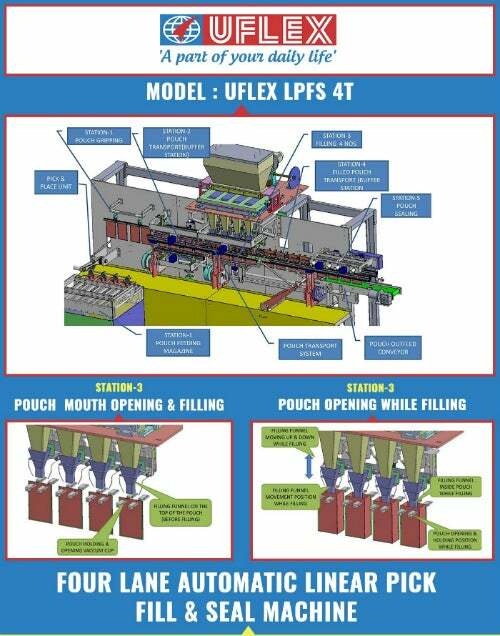 “I am glad that my Engineering Team at Uflex has created a machine that can ensure wider mouth openings of flat bottom pouches ensuring easy filling at much higher speeds and output rates. This in turn will surely give boost to the sale of flat bottom pouches. Having a stellar pouch without an appropriate filling machine is just like having a great car without tyres. Visit Uflex at Hall No.1, Stall C-42 at International PackTech India 2016 to be held from 15-17 December at Bombay Convention & Exhibition Centre, Goregaon (East), Mumbai, India.